RENO, NV MARCH 15, 2010: The opening round of the 2010 VORRA series is this weekend March 20-21, 2010 at Prairie City, CA. VORRA, the only organization to offer both short course and desert racing, kicks off its seven round series with a short course battle at the Prairie City OHV Park in Folsom, California. “We are excited to start another season with a lot of new faces coming to the start line, along with several that have been with the series since its inception,” said Wes Harbor the series promoter. Many of last years top competitors have committed to yet another year of aggressive racing. Sam Berri, Class 1 overall winner in 2009, said “This will be my 25th straight year racing the VORRA series where my car has never missed a race. I am looking forward to 2010 with more competitors which will bring more challenges.” Shannon Harwell and Steve Sullivan will also be back for the green flag in Class 1 to see if they can’t take a checkered flag from the noteworthy Sam Berri in 2010. 2009 was a three way battle to the end in the Class 10 with Red Team Racing coming out on top with the car that also finished the 2009 Vegas to Reno in the midst of their VORRA season. They are planning to defend their title in 2010. Class 7, Class 9, the classic Class 11 also promises racing action for the traditional off road racers. In 2009, Harbor created a new truck class called Group T. This combines several class types into one competitive group to fuel the racing spirit. Over the course of the year, 24 trucks competed in this class where Bruce Field in a Class 8 took the overall points series win. This years line up looks just as strong with 2009’s top three: Bruce Field, Mike Koenig & Jake Povey will all be coming back to battle for the championship. Promoter Wes Harbor believes that “off road racing has its roots in people’s garages” and continues to keep the entry fees to a minimum while maintaining a high quality racing experience. One of the bigger classes in the series is the Sportsman class where anyone can test their skills at racing. 2009 consisted of a solid battle where Kevin Yoder in a rock buggy took the final championship. Ten or 1/3 of this class will transfer into their respected classes, leaving 20 or 2/3 in the Sportsman class to work to the top in 2010. The Pilot and UTV class will run on the track together again, but the action should be more aggressive. The UTV class looks to pick up three more consistent racers to create a battle that hasn’t existed in the past. A new Quad/ATV Division of VORRA is set for the 2010 series, allowing it to be completely separate track from the cars and trucks. “We feel that this will give the ATV racers a better experience because we can make a more purpose built courses that challenges their skills and their machines,” explained Harbor. The 2010 series should be the best yet! There is an addition of Ultra4 and Class 11 to the line-up and the Short Course races will have a new 5-lap 3-Moto program replacing the 8-lap 2-Moto system. 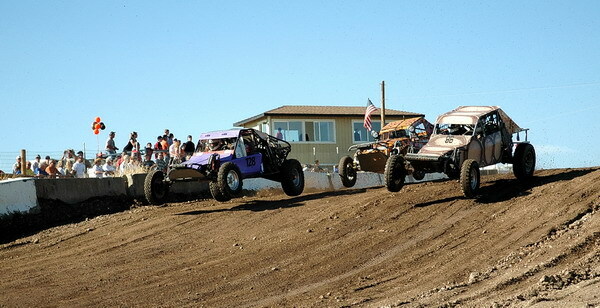 There are battles already brewing, and the dropping of the green flag on Saturday morning will launch the 35th running of the Valley Off Road Racing Series.